I may spend most of my time featuring the most innovative and industrious up and coming designers of today/tomorrow but if you have ever seen my personal instagram account then you would know my hobby off the clock is visiting modernist buildings and architecture. I am a full on addict. Thankfully, living in Paris, I am in an epicenter of incredible architecture, hiding in-between and around the beautiful haussmannian city. I recently had an instance, when visiting an obscure part of the city to visit a modernist apartment complex, being confronted by the securty guard while trying to get into the locked front door. Our coversation went something like "Madame, why are you trying to get into the building, do you live here? ", "Well no monsieur, the lobby is just so beautiful - I really wanted to take some photos actually ...", "This lobby...? I look at it every day and never thought of it as beautiful... Uhh sure.. you can come in". Giving me that 'Freaky American girl' (but still intriguing) side glance I know all too well. So when I found out there was a book centered around this very topic, I had to get my hands on it. 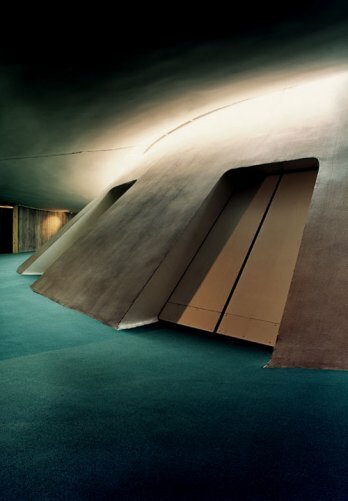 I thought I knew all of the spots in Paris but Gestalten's The Tale of Tomorrow had a plethora of amazing buildings all over the world from Niemeyer to Le Corbusier and beyond. Still having nice weather, I invited Coco, a dear friend and our Special Projects Manager, over to my house for a picnic to have a look at where we could check out next weekend. Nestled away in Paris' surrounding 'Banlieu', or suburbs, you will find one of the most magnificent examples of social housing project architecture on the planet (in my humble opinion). Famed Spanish architect, Ricardo Bofill, was commissioned to map out this three piece social housing complex in 1978. If I can recommend a must see architectural day trip while visiting the city of light, I would highly recommend Les Espaces d'Abraxas. Growing up in New York, I wouldn't have imagined social housing projects and incredible architecture in the same sentence ... but I have learned that here in France, they are some of the city's most impressive and unique structures. 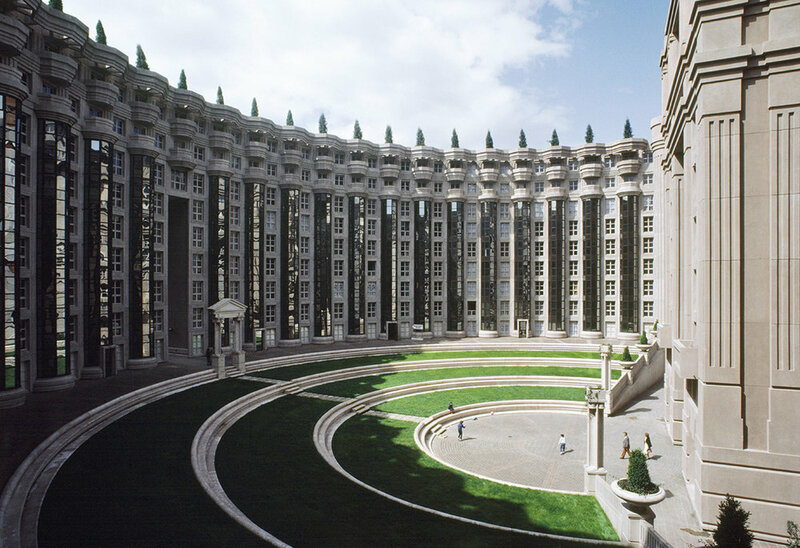 Second on our list is, Les Arcades du Lac, another social housing complex designed by Bofill in the early eighties. It is said that he had envisioned to create a 'Versailles' for the people, and to offer a contrast between the new housing of the 1970s and 1980s and the earlier Le Corbusier-inspired housing projects of the 1950s and 1960s. 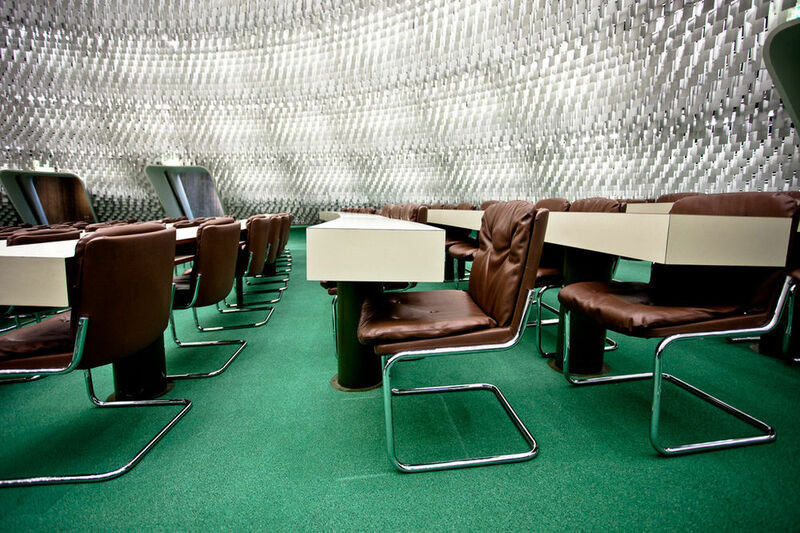 Now we get to my personal favourite architectural gem in ALL of Paris, the Communist Party Headquarters, or PCF for short en français, designed by Oscar Niemeyer. You may have remembered my article about North Korean Interiors and my semi-controversial views and love for communist architecture here. Say what you like but leaving politics aside, those communists have damn good taste. Built in 1971, this stunning building is somewhere between modernist space ship and the seven wonders of the design world. An absolute must see for any archilover, this space is open to the public on the third weekend of September for the 'Journées européennes du patrimoine' or by reservation by mail. If you are a modernist architecture fanatic, fashion enthusiast or happened to see our series of Palais Bulles inspired prints by Jonathan Niclaus, chances are you are already very familiar with this iconic home in the South of France. Featured in endless fashion photoshoots and host to Dior runway show, this home designed by Hungarian architect Antii Lovag is an organic, modernist masterpiece. Built between 1975 and 1989 near Cannes, the home was bought by French fashion designer Pierre Cardin in 1991. Interested in making it your home? It has since gone on the market for a cool three hundred and fifty million euros if you have some spare cash on you. Last but not least we have the apartment complexes just outside of Paris, 'Les Choux de Créteil', or the Cauliflowers of Créteil. Created in 1974 - the architect, Gérard Grandval, was undoubtedly inspired by the fact that this land was previously used to grow the majority of vegetables feeding neighbouring Parisians. These ten cylindrical buildings are regarded as a symbol of 1970's French architecture and a must see if you have a bit of time to explore when visiting Paris. Now in my new minuscule oasis, I sit and crack open Gestalten's 'Small Homes, Grand Living' to see if I can get to the bottom of how to make the best of a small living space. Have a peek at the (very) rough new palette I am starting off with and what I plan to apply from the book when redesigning my new home. Why do us 'curators' choose what we choose to display and share? What makes a great image? In an era full of Instagram photographers (some of which are very talented in their own right) - what truly defines and separates the masters of Still Life Photography? I plopped myself down on an armchair in my cozy staycation room at Le Pigalle, ordered myself a café crème with the iPad in my room and cracked open 'Visual Feast'. Start Me Up! is a beautiful introduction to a plethora of brands from Finland to Singapore who take creative means to communicating their brand’s ethos, quality and background through branding and visual means. I threw on a pair of espradilles and packed up my new book, A Poor Collector’s Guide to Buying Great Art by Erling Kagge, to learn, poolside, how a girl of moderate means, but subjectively, million dollar taste - could start collecting art. I’m very excited to review my personal business bible to creative entrepreneurship and source of inspiration, The Monocle Guide to Good Business, for our first instalment of Gestalten book reviews!